I’m late to the show. Unlike millions of others, I didn’t have a family tree on Ancestry.com until about a month ago. Since I did a DNA test with AncestryDNA, I decided to add portions of my tree as cousin bait. While I appreciated the suggestions that the system makes for potential parents, I soon realized these recommendations aren’t always correct. Sometimes they aren’t even close! What Are Potential Father and Mother Recommendations? When you input your family tree into Ancestry.com’s system, it checks to see if your tree matches any others. 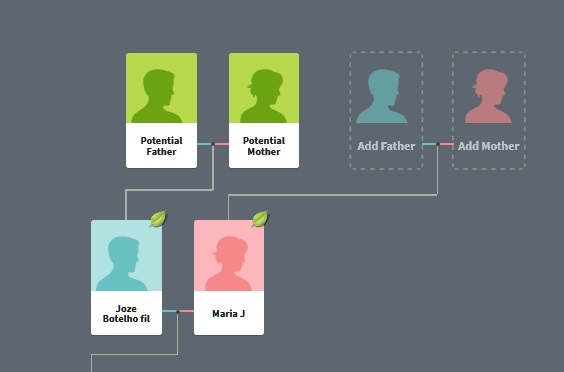 When it finds a match and sees you are missing the next generation, you will see a green box pop up suggesting who the father and/or mother might be. I don’t know who Joze Botelho’s parents are. I’m hoping someone else has already figured this out. I took a peek at the father. He isn’t a Botelho, which isn’t that big of a problem. Surnames aren’t always carried down through the father. However, Joze had the word “fil” after his name, which makes me think he’s named after his father. 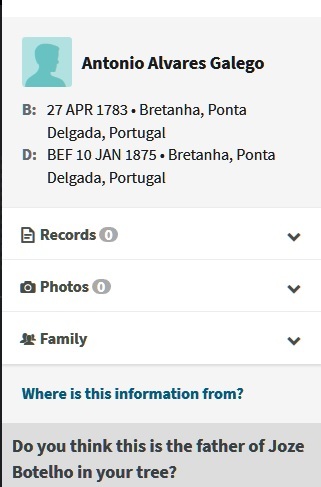 Instead, I see Antonio Alvares Galego who is born in Bretanha. Since the surname might be carried forward from the mother, I took a look at her suggestion. Her surname is Pacheco. Not even close. This may not be an issue. 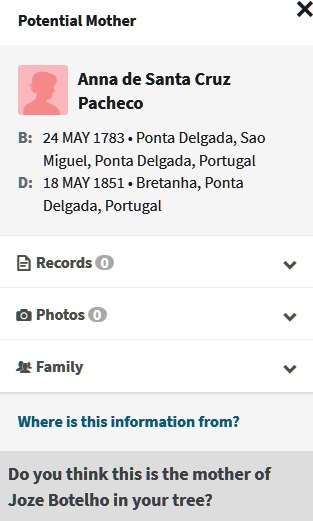 Portuguese children don’t always take the name of either parents. By clicking on Family on the Father or Mother recommendation, I can see who the children of this couple are. Perhaps I’ll see a list of children with the Botelho surname. At least, I should find a Joze Botelho among them. There aren’t any Botelho children in this list and the only Jose I see is Manoel Jose. My research tells me that Joze Botelho is from Maia, Ribeira Grande. The suggested father is from Bretanha. The suggested mother is from Ponta Delgada. There isn’t anything in this family group that suggests they are related to my guy. How in the heck did the system come up with this suggestion? Not all suggestions were this far off. But, many were not the right people or there wasn’t enough information to make a determination. One only had a surname without a first name for the father. I’d say this suggestion system still needs work. I admit that I have my own input quirks. However, I try to stay consistent within my own database. After I accepted a couple of suggested parents, I realized the hassle I created for myself. First, not everyone inputs dates the same way. When I began my family tree, I was taught that you enter day month year like they do in many countries. It wasn’t so much that I saw the American format of month day year, but that some folks input dates with back slashes like 1/11/11. I don’t want those in my tree! Then, there are multiple formats for place names. There isn’t any standardization and some people come up with bizarre ways to identify places. I’d like to keep the format the same within my tree. The last issue that I didn’t care for is that some like to enter women’s names under their married name. Some like to use both the maiden name and married name. When I write women’s names, I use the format Marguerite (Jones) Jackson. But, when I enter them into my database, I use first name/maiden name. The reason I do it is because it seems right to identify women by their own name. It also makes things less confusing. Two people of the same surname can marry. It is all too tempting to add potential fathers and mothers to my family tree. We all love adding generations, don’t we? And, this is a time saver. Since I’ve seen several trees with my ancestors attached to the wrong families, I suspect many people don’t question these suggestions. However, it’s far too easy to make a mistake without seeing the source documents behind the research. I’m fortunate in that on my Azorean and French lines I already have my research well into the 1700s. I’m able to take these suggestion and compare them to my work. Most of the time, I input people manually. It’s easier. Also, it save me the trouble of editing formatting differences. Take these ancestor recommendations for what they are, unproven suggestions. Note them, follow up on them. Add them to your tree if they are the right people, but only after you’ve got proof.